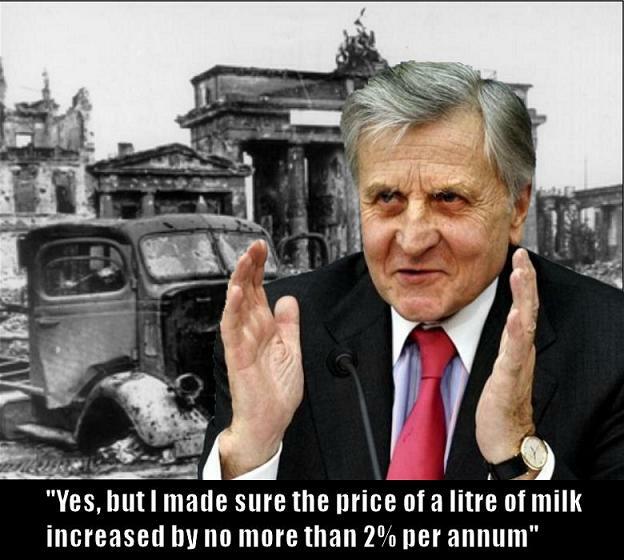 So farewell then Jean-Claude Trichet, the 68-year old president of the ECB whose last day in office is today. From tomorrow, the governor of the Italian central bank, Mario Draghi will take over the reins as ECB president at this crucial juncture in the young life of the euro. The avuncular-looking Jean-Claude has been president of the ECB for exactly eight years since 1st November, 2003 and has been in the role during the inflation of Ireland’s calamitous credit bubble which burst in late 2008; and since then he has been increasingly influencing domestic behaviour – for example, it has been claimed that although Jean-Claude hasn’t explicitly threatened Ireland with a withdrawal of special funding if we burn bondholders, Minister for Finance Michael Noonan understands that “a nod is as good as a wink to a blind horse”. And although the payment on Wednesday this week of the USD 1bn (€714m) Anglo unsecured, unguaranteed senior bond is not mandated by the terms of the Memorandum of Understanding with the IMF/EU/ECB Troika nor is it a term of written agreements with the ECB, it is “understood” that burning the Anglo bondholders would have consequences; and given we rely on the ECB for €150bn of extraordinary funding to our banks (€100bn from the ECB directly and a further €50bn from our own central bank under the ECB’s auspices), it is assumed that Minister Noonan doesn’t want to rock the boat and potentially put that funding at risk – never mind the fact that the ECB can’t just unilaterally withdraw funding to any one country. Although Unca Jean-Claude might epitomise the ECB position on repaying bondholders in failed Irish banks, he is but one representative; there is evidence that other representatives are more blunt in their position – remember this from June, 2011 – “in the meantime, we may have to come to the conclusion that it doesn’t really make sense for the ECB to keep putting €100 billion into Irish banks. What we are doing is actually illegal, but we have being doing it because we want to help Ireland. Maybe we might come to the conclusion that we should stop” Remember the ECB is directed by an Executive Board of six non-Irish bankers/economists and a Governing Council of 17 national central bank governors including our own Patrick Honohan. Not much is going to change tomorrow. So what legacy has the career French banker left behind? The fact that respected voices are openly discussing the collapse of the euro and the consequences is not a good sign. And despite the cheering last week, it seems the latest deal on the EuroZone (EZ) crisis is meeting obstacles with potential funding sources not biting our hands off to stuff money into the various EZ funds and bailouts. So Greecestill appears to be teetering on the edge of an unstructured default. Italian bond prices are touching record highs today, ditto Spain. Ireland is still in shock with having to put €60bn (40% of GDP) into its banks. The European bank stress tests are a by-word for farce and a large part of the blame for the dismal reputation and poor financial condition of EZ banks today must be shouldered by the ECB – interbank lending is largely frozen, deposits by banks at the safe-haven ECB are at elevated levels, the EZ banking system is sclerotic. And austerity programmes are causing unrest and collateral unrest from Madrid to Helsinki, Athens to Ballyhea. Before our entry into the euro in 2002, we might have dealt with the current type of crisis by doing what the British are doing and print money to inflate our way out of debt, and to cushion the adjustment of national income to expenditure and to distribute the pain via the drop in living standards across all of society. But Unca Jean-Claude is opposed to so-called Quantitative Easing (QE), so we are left with the blunt instrument of austerity. As regards the setting of interest rates, many still see the decision of the ECB to increase rates in 2007 as wrong and that in 2008/2009 the ECB was too slow to reduce rates. As for the positives, Unca Jean-Claude will trenchantly defend his actions as being primarily directed at maintaining price stability for the now-330m people in the EuroZone – keeping inflation at around 2% – and he has achieved that. He might also point to the currency maintaining its value against the US dollar and pound sterling, though QE in both theUSandUKwill be in part responsible for that. He has resisted QE in the EZ which might put upward pressure on prices, and he has been a exemplary proponent of the “no bondholder left behind” policy which he would justify on the basis of keeping funding costs for all EZ banks under control. And as for default on any bonds – sovereign or bank – that would be anathema to him unless it was part of an agreed restructuring with bondholders. All in the name of price and cost stability. So au-revoir then Jean-Claude and ciao Mario! Sadly the change will mean little here. Stop Press! NAMA publishes its fourth enforcement list, more foreclosed property on offer. Here’s the full list (the file is 3MB so it might take a moment to load). Here’s the new stuff. (1) Real estate property subject to loans in NAMA to which receivers have been appointed. The receiver’s website is shown against each property. (2) This is all the real estate foreclosed sorted by country, and then region. (3) Not all of the property may be for sale. (4) Contact the receiver with enquiries or expressions of interest in the first instance. Only pester NAMA if you’re not getting any response from the receiver and make allowances that receivers will be busy with queries, particularly after a new release of foreclosed property. (5) If you think there are mistakes on the list, contact NAMA. There will be an update on the detail of the new list later but it is dominated by Irish (Galway and Clare) property. What’s the background to the list? 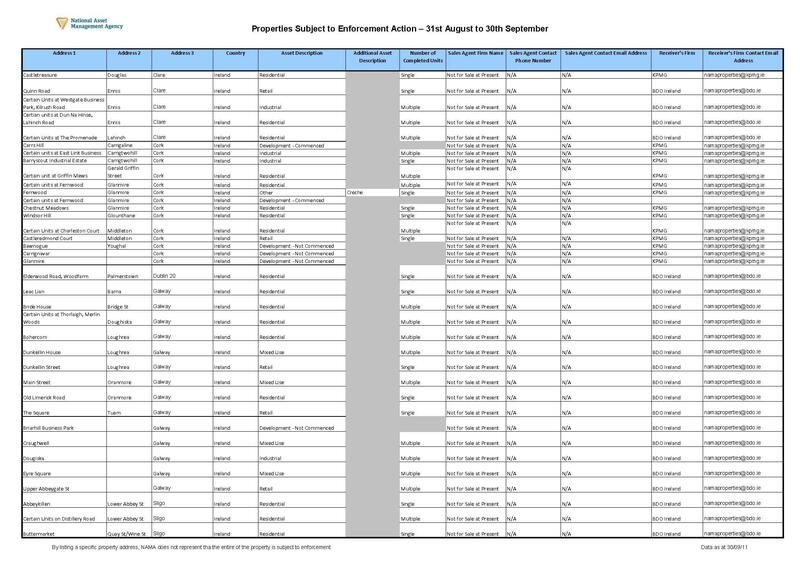 In July 2011, coinciding with the publication of its annual report, NAMA published its first enforcement list – properties to which receivers had been appointed following default on loans by developers. That list was of 850-odd properties and generated an immense buzz. NAMA indicated the list would be updated on a monthly basis. You will find the previous editions of the enforcement lists here, together with a list of reported NAMA sales. This morning the Central Bank of Ireland (CBI) released its monthly data on banks, deposits and loans in Irish banks as at 30th September 2011. During the month of September 2011, deposits by ordinary Irish households and businesses continued to decline but at a reduced rate compared with previous months. In terms of the so-called covered banks (essentially the two pillars, AIB and Bank of Ireland, and also Permanent TSB) these deposits were down just €133m from the previous month and now total €102bn; the decline over the last 12 months is €23bn, so the monthly rate of decline has slowed considerably. It hasn’t yet reversed, mind. The CBI doesn’t provide an analysis of deposits at the covered banks – about the only analysis it doesn’t provide – but in terms of all banks operating in Ireland including foreign and IFSC banks, Irish household deposits increased by €500m in September but ordinary Irish company deposits fell by €2.5bn in the month. 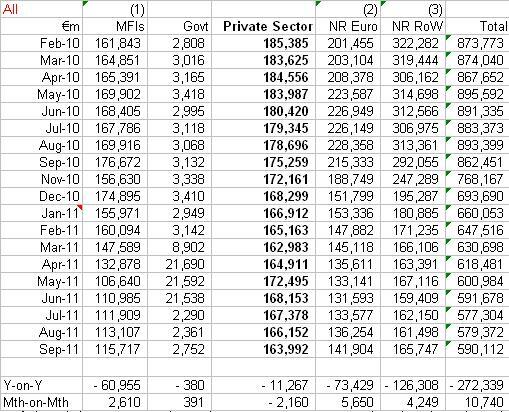 Non-Irish residents deposits in the covered banks rose in September 2011 by over €500m – only the second monthly rise in the past year, the other being in July 2011. One possible inference is that confidence in the Irish banking system is returning more quickly outside the country than within it. It might require another few months of increases though before that inference would be reliable. 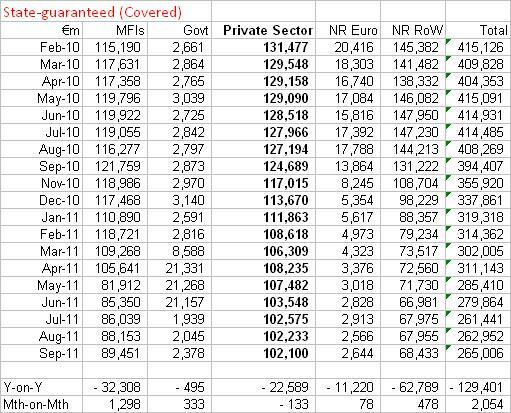 Deposits in the covered banks overall increased – for the second month running – by €2bn in September 2011, as a result of deposits from the Government and Monetary Financial Institutions (MFIs –see below). The CBI is not particularly helpful with its definition of MFIs which is reproduced at the bottom of this blogpost but it seems to include credit union accounts. Substitute Scotland with Ireland, and England with Europe in the above and you might get an idea of feelings today after the latest marathon 2-part EU summit concluded in the small hours this morning, and resulted in the obligatory summit communiqué, available here. In short, the European bailout fund which started at €250bn and rose to €440bn is now to be boosted to have €1tn of “firepower”, EuroZone banks are to get €100bn of recapitalization by July 2012 so as to boost confidence and absorb losses, and Greece is to get a 50% write-down in its debt. There’s also talk about more oversight of national finances and a tax on banking transactions (as part of a global regime). Bank shares in Europe have rallied today in response. Interest rates demanded on government bonds have come down slightly meaning lenders think there are better chances of getting their bond investments back. Delve into the communiqué though, and you can’t fail to notice the woolliness of the actions to be taken – the EU “recommends the definition by the end of the year of the process to achieve this objective” in relation to raising the Italian pension age might take the biscuit, but the second Greek bailout is still undefined and holders of Greek debt are to be “invited” to take a 50% write-off, it’s not clear what happens if they decline the “invitation”; most significantly though, there is no detail on how the mooted €1tn funding of the bailout fund will be sourced. It is also unclear how EU countries will adopt new rules giving the EU pre-approval rights over EuroZone national budgets where deficits are being run up; but at least that won’t concern us here inIrelandfor a long time, as we need Troika approval before we blow our noses. But there’s nothing of consequence for Ireland in the latest summit. Perhaps that shouldn’t be surprising in a EuroZone with 330m people and a GDP of €9,200bn -our 4.6m population and €150bn GDP gets lost in the mix and it is France and Germany that dominate proceedings. But with the gross injustice of having to pay USD 1bn (€711m at today’s exchange rate) to Anglo’s unsecured, unguaranteed senior bondholders next Wednesday, 2nd November, it is worth having a quick review of the quality of the people who are, according to the Government, forcing us to stump up 100% of the cost of the Anglo bond, but at the same time just agreed to a 50% write-down (or write-off) of Greece’s sovereign debt. They may not be “effete arseholes” but they’re hardly superior geniuses either. It would be hard to beat the handbag-clutching outrage displayed by some leaders in Europeduring this crisis. Who can forget the ear-bashing delivered by European Commission president, Portugal’s Manuel Barroso to former MEP and current TD Joe Higgins back in January 2011. Manuel seemed almost asthmatic in his eagerness to pass the blame for the Irish financial crisis to Ireland, and stop any suggestion that policies in Europe and in particular, the ECB might have contributed to the national crisis. And whilst that might have been dismissed as a storm in a teacup, the continuing umbrage taken at the temerity of ratings agencies, who had the absolute gall to downgrade countries with 120% debt:GDP, would have been more serious if it wasn’t farcical. Talk of creating a European ratings agency might have subsided, but the “howling at the moon” by European leaders will not be quickly forgotten. The dismissal of the work of ratings agencies as “so-called clairvoyance” by Olli Rehn’s office in July 2011 after the Portugese downgrade would probably win the prize for European petulance. So Ireland was one country within the community of 17 in the euro area, suffered an economic shock when the property and banking sectors imploded and found itself with a nasty deficit when tax revenues collapsed and spending stayed elevated and was exacerbated by bailing out its banks. And the country needed some time to adjust spending and taxation so as to reach a point where it could run a balanced budget. The country fesses up to its problems and seeks a bailout programme to tide it over the period of readjustment. And what do our friends do? Firstly they charge us a 3% premium (I think the mafia call it a “vig”) over cost for the funds so that we can, in part, repay European banks guaranteed and secured bonds; not only that, but then one of our partners insists that we change our tax system for corporations as a quid pro quo for a slight reduction in the profit being earned on our bailout. Charming! Remember the stress tests in 2010 that gave both Bank of Ireland and Allied Irish Banks clean bills of health only for both banks to need nearly €20bn of a bailout months later. And then more recently on a warm Friday in July 2011, we all gathered around the monitors to hear the results of the second European banks stress tests. Would it be 15 or 30 banks that failed the stress tests and would they need €30bn or €50bn of new capital? Why no, said the EBA, just eight banks didn’t have enough capital and €2.5bn would do the trick. How we laughed when one week later, one Spanish bank by itself needed €2.8bn of new capital and €3bn of emergency liquidity! And three months later, the €2.5bn requirement has grown to €100bn. Funny, funny people with impeccable comedic timing. When you recall that we have known since at least last year that Greece faces a 150% debt:GDP, you really have to admire the denial and delusion of claims at the heart of Europe that austerity alone could rescue Greece and return it to financial health. And with a great flourish at the July summit when a 21% debt writedown was proposed, it was still obvious that this wouldn’t be enough. And even today with a target of delivering Greece to a debt:GDP of “only” 120% by 2020, it again seems incredible, when you consider Greece’s reputation for attracting investment and the continuing weaknesses in its economy. Minister Noonan might have justifiably claimed thatIrelandwas not Greece, but Greece is not Italy either and doesn’t have the ability to attract investment and generate income so as to sustain a 120% debt:GDP. A further write-down will inevitably be in prospect for Greece. Finally, two small points on our own Government’s actions. We are being told that if we were to get a 50% writedown on our debt, we would need endure years of austerity. Given that a 50% writedown would simplistically mean forgiveness of €80bn of debt, I wonder if we could actually endure some more austerity; and anyway if our debt:GDP fell to 60%, would we really have austerity for more than a couple of years; surely with such low debt and a growing economy, we might be able to get back into bond markets sooner rather than later. And secondly, I can’t help but notice that the much-touted Comprehensive Spending Review which was to have been completed in September 2011 has still not been published. Nor has the 4-year plan which was signaled in August 2011 and was to be published in October 2011 and would provide a degree of certainty as to new taxes and levies in the next four years. Neither will be popular in the sense that both will make more tangible the future austerity measures. And I notice what appears to be an agreed position across the Cabinet as to the message to be deployed to deflect criticism of the repayment of the USD 1bn Anglo bond next week and that message is : Anglo will pay the bond out of its own resources, the taxpayers’ resources will not be affected, Anglo has recently sold North American assets for billions and it is from the proceeds of these sales that Anglo will repay the bond. This is patent nonsense but it seems to be part of the policy to dampen down what should be an outbreak of outrage. 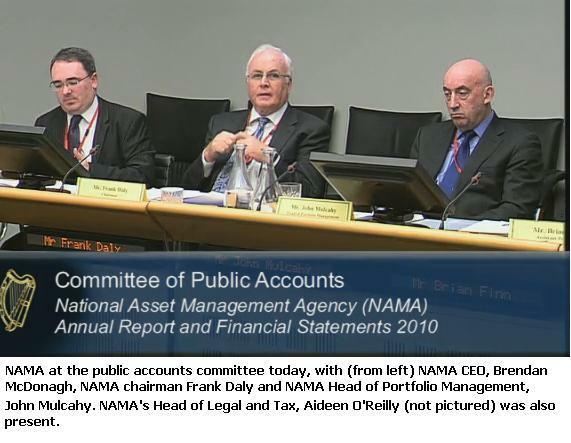 NAMA before the public accounts committee – “mind the pennies and the pounds will mind themselves” NOT! (1) NAMA has approved €4.6bn of sales to date. 80% are overseas, 20% inIreland. The overseas disposals have earned NAMA a profit of 12-15% above what NAMA paid for the loans. Some of the Irish disposals have been at a loss, put at 5-25%, compared with the loan acquisition value. (2) NAMA expects to have disposed of €9bn of assets by December 2013, 70% of which are expected to be overseas. Besides theUSand theUK, NAMA has significant assets in Germany, France and Portugal (and only about €120m of assets in other European countries –Malta, Poland, Czech Rep were mentioned). (3) NAMA has approved advances of €900m to 70-80 developers with €500m of that being handed over in cash. (4) NAMA is directly managing 188 of the 850 debtors controlled by the Agency. The rest are managed by the banks directly, with NAMA having overall control. To date 143 business plans have been “assessed” and 30% have been subject to full or partial foreclosure action. By the end of the year, it is expected that all of the 188 plans will have been “assessed” plus some 200 of the smaller business plans for the borrowers managed directly by the banks. (5) Developer salaries; by the end of 2011, between 110-120 developers will be paid salaries of €70-100,000 per annum each, plus there are 2 who will be paid €200,000 per annum. NAMA stresses that these are cheaper than employing receivers or generic property management or asset management companies. NAMA says that the two €200,000 salaries relate to developers managing €2bn portfolios, and that a professional asset manager would typically charge 1% per annum or €20m. So NAMA says it is getting value for money, despite the public perception of a bailout. (6) In terms of transparency of disposals, which is the meat of what NAMA does, the NAMA chairman said he was “minded” to seek approval from the NAMA board for better transparency but he wouldn’t make a commitment. (7) In terms of the disposal of no1 King William Street, NAMA claims that the property was “extensively marketed” but only gave advertising in Property Week in support of that claim, there were 30 viewings of the building and 7 parties submitted bids which ranged from GBP 65m to GBP 67.5m. NAMA was not asked why a better yielding price wasn’t offered. Again from a personal perspective, I could not find the property on the receiver’s [GVA Grimley’s website]. There may well be reasons why the price achieved was some GBP 6m less than might have been suggested by the “going rate” yield but we didn’t find out what the reason was, today. (8) Montevetro was apparently on the market before it was sold to Google earlier this year. It was advertised for sale or rent by the developer, a Treasury Holdings company. That might come as a surprise to some people. NAMA claimed that the only party that would have had an interest in the 210,000 sq ft building “then” was Google. Times have obviously changed because the Central Bank of Irelandand Bank of New York Mellon are both reportedly chasing the 230,000 sq ft Liam Carroll building designated for the Anglo HQ. (9) The Anglo HQ may be sold by the end of November 2011. Negotiations are at a sensitive stage, but NAMA agree that the site is an eyesore and emblem of what went wrong and they genuinely seem to want to see the project completed. (10) NAMA claims that the maximum it could have earned on the Maybourne loans was GBP 660m (which equates to the €800m widely reported in the Irish media) which was the par value of the loans. Whilst that would normally be logical there seems to be some suggestion by Paddy McKillen that NAMA might have earned more, and there are also suggestions that the loans represented a stepping stone to acquiring equity in the Maybourne group and thereby getting control over valuable assets. Let’s see what Paddy McKillen has to say. (11) NAMA is in a crowded market-place in Ireland and is competing with ACC and its €2bn portfolio, Danske/National Irish Bank and its €2bn portfolio, Bank of Scotland (Ireland) and its €30bn portfolio written down to €15bn and RBS and its €15bn portfolio written down to €7.5bn. “We’re watching them and they’re watching us” said the NAMA CEO. (12) NAMA has a full year, internal cost of €45m which comprises salaries of €20m (representing an average of €100,000 for 200 staff) and other costs. Maybe it’s the cynic in me but I have a feeling a large part of the other €25m will comprise headcount related rewards and benefits, pensions for example. (13) NAMA apparently tendered for the auctioneer contract to sell Derek Quinlan’s art collection. There was a tender document, even if it wasn’t published on the NAMA website. Christie’s is not charging a fee to sell the art, and apparently Irish auctioneers were also willing to sell the art without charging a fee. The thing is that Christie’s will charge buyers 15%+ and that is expected to yield €400,000+ for the auction house. I have seen suggestions that NAMA should have formally tendered for this service because the concessionary value was more than €250,000, but regardless I think some auction houses might now ask why there was no public tender. And on the subject of art, NAMA is apparently poised to take control of a second art collection. (14) The overall cost of the NAMA operation in 2011 will be an estimated €150m, comprising €45, for NAMA’s internal costs (see above), €75m for the banks who are administering the loans day-to-day and managing the 662 smaller loans and €20-30m for legal and professional services bought by NAMA. (15) NAMA has made an operating profit of €400m for the first nine months of 2011 and still expects a full year operating profit of €500m. NAMA will need deduct impairments and NAMA has confirmed there will be impairments in 2011. The NAMA CEO would not be drawn on the quantum of impairments in 2011 and said it would only be calculated at the end of the year, but he did not reject a suggestion from Deputy Fleming that it might be €1bn, which if correct might see NAMA needing a small amount of new capital. (16) Worryingly the NAMA CEO says that central London’s yields are at 4% which is an historical record, and that apparently is the justification for selling there now. Not only have there been sales below 4% (the 3% yield sale of a Rolex store in Knightsbridge recently being a case in point) but I would have thought that NAMA would have learned its lessons with yields. Remember September 2009 when then Minister for Finance, the late Brian Lenihan said that yields in Irelandwere at an historic high meaning we were close to the bottom? And prices have quite nicely fallen 25% since then? Yields are a factor in determining prices and projections, but just one factor. Central London has a severe shortage of prime property and inflation is likely to be 4% for the next couple of years with the new round of Quantitative Easing in the UK – if NAMA is relying solely on yields to inform its timing of London sales, then we should be worried. (17) With respect to the recent Michael Geoghegan review of NAMA, it seems to be the NAMA view that the Agency initiated the review, the findings are confidential and weren’t written down apparently, but the NAMA chairman does not consider the recommendations to be tantamount to creating a watershed in NAMA’s evolution, nor does he see there being significant change. (18) NAMA has acquired €74bn of loans for €32bn and that’s likely to be the end of the acquisitions following the recent completion of €2bn of acquisitions. The average haircut is 58%. Interestingly NAMA said that because of the way in which it valued loans, it is likely that the acquisition price equalled the value of the property at 30th November 2009, with the Long Term Economic Value premium being offset by discounts that the EU allowed NAMA to make to the loans. That may well be true. (19) The Comptroller and Auditor General said that he would give consideration to publishing par values of loans in the accounts alongside the NAMA valuation. That would be welcomed in many quarters, so that we can see the scale of write-downs and write-offs. (20) To finish on a lighter note, you would have to wonder if Brendan McDonagh was being sponsored today to say the word “effectively”. When the transcript becomes available next week it will be posted here but he seemed to use the word every half minute, particularly when he was on shaky ground. With respect to the Committee’s oversight of NAMA, it is to be hoped that it will be able to acquire better information on NAMA’s disposals in order that it can meaningfully examine NAMA’s performance in disposing of €32bn of loans. It would be a shame if future hearings were to concentrate on the bonus of the NAMA CEO (max of €260,000, waived by him last year) to the exclusion of examining whether or not NAMA achieved good prices on €4.6bn of disposals. UPDATE: 27th October, 2011. Further to point (13) above, it seems that the 2nd developer to see his art collection succumb to NAMA is Alburn’s Noel Smyth. The Irish Independent reports that NAMA has “taken possession” of nearly 400 works which included paintings that had previously been displayed at the Tate Gallery (London). The Independent claims Noel Smyth has said that he is “happy” to work with NAMA on “the transaction”, presumably the recovery and sale of the collection. There doesn’t appear to have been any public reporting of efforts by Noel to re-finance his Real Estate Capital portfolio in the UK since April 2011, but he was facing challenges to re-financing proposals, which were set out in a detailed note by CBRE here. This morning has seen the publication of the seventh CSO residential property price indices for Ireland. The inaugural series was published by the CSO on 13th May 2011 and covered the period from January 2005 to March 2011. This morning’s release covers the month of September 2011. 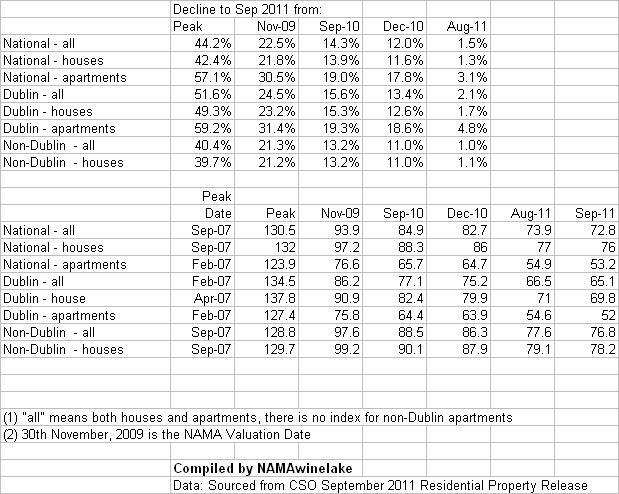 Here’s the summary showing the index at its peak, November 2009 (the NAMA valuation date), September 2010 (12 months ago), December 2010 (end of year, start of this year) and September 2011. Now that the Permanent TSB/ESRI has abandoned its quarterly house price index, the CSO’s isIreland’s premier index for mortgage-based transactions. It analyses mortgage transactions at eight financial institutions : Allied Irish Banks, Bank of Ireland, ICS Building Society (part of the Bank ofIrelandgroup), the Educational Building Society, Permanent TSB, Belgian-owned KBC, Danish-owned National Irish Bank and Irish Nationwide Building Society. The index is hedonic in the sense it firstly groups transactions on a like-for-like basis (location, property type, floor area, number of bedrooms, new or old and first-time buyer or not) and then assigns weightings to each group dependent on their value to the total value of all transactions. The index is an average of three-month rolling transactions. I don’t think the CSO would be happy with this approach but it seems to me that the PTSB/ESRI series as represented by its historical indices closely correlates with the performance of the CSO indices. What’s surprising about the latest release? Although the monthly decrease of 1.5% is elevated, we have had similar declines in recent months. What is astonishing is thatDublin apartment prices declined by 4.8% in just one month, following the 6% monthly drop last month.Dublin apartments are now down 59.2% from peak. Are prices still falling? Yes, and the 1.5% monthly drop in September 2011 was similar to the 1.6% decline in August 2011. How far off the peak are we? Nationally 44.2%% (also 44.2% in real terms as inflation has hardly changed since 2007). 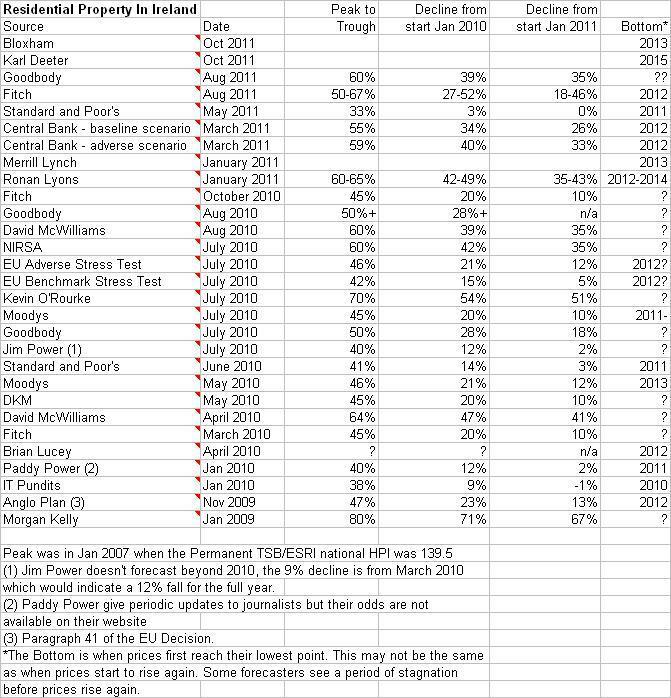 Interestingly, as revealed here,Northern Ireland is some 45% from peak in nominal terms and 52% off peak in real terms. Are forbearance by mortgage lenders, a draconian bankruptcy regime and NAMA’s (in)actions distorting the market? Or are cash transactions which are not captured by the CSO index so significant today that if they were captured, the decline in the Republic would be even greater? What does this morning’s news mean for NAMA? The CSO index is used to calculate the NWL Index shown at the top of this page which aims to provide a composite reflection of price movements in NAMA’s key markets since 30th November 2009, the NAMA valuation date. Residential prices are now down 22.5% from November, 2009. The latest results from the CSO bring the index to 833 (20.0%) meaning that NAMA will need see a blended average increase of 20.0% in its various property markets to break even at a gross profit level. The CSO index is a monthly residential property price index. Irelanddoes not yet have a publicly available register of actual sale prices, but legislation to give effect to such a register is presently before the Oireachtas – read the latest on the House Price Register here. There are three other residential price surveys, based on advertised asking prices or agent valuations – for the latest see here. 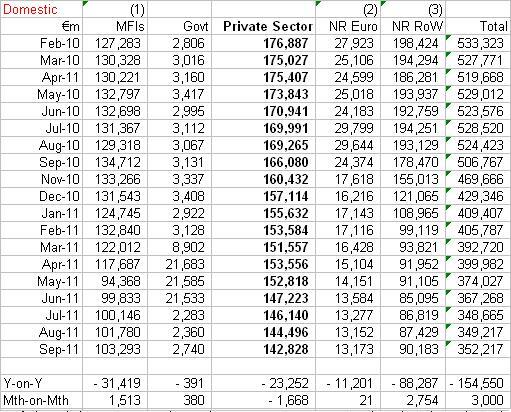 Lastly the Department of the Environment, Community and Local Government produces an index based on mortgage transactions, six months after the period end and not hedonically analysed. Breaking news this afternoon that a Dublin court has granted a €74m liability order in favour of NAMA against developer Jim Mansfield; nothing unexpected about that at all, and indeed next month Bank of Scotland (Ireland) is likely to secure an order for an additional €204m against the 72-year old developer, perhaps most associated with the Citywest development in west Dublin and Weston Airport (formerly Weston Aerodrome). Together the liability orders are understood to be the largest ever in the State which is interesting enough. But what was really interesting about the case today was what the judge reportedly had to say about NAMA’s receivers. The judge in theMansfieldcase was Judge Peter Kelly, perhaps the most prominent commercial judge in the country. Jim Mansfield had opposed the application by NAMA for a liability order on a number of grounds, one of which was reported by the Irish Times to be the rejection by the NAMA-appointed receiver of “an offer of about €11.9million for Palmerston House and estate and concerning any sale of Weston Aerodrome and West Park apartments” The Irish Times reports that Jim was claiming that NAMA would not accept offers on foreclosed property from parties connected with the Mansfield group. There seems to have been a claim that this rejection was in violation of a NAMA code of practice. The Irish Times reports the judge’s response to this defence which is reproduced at the top of this blogpost, and although there’s no claim that the judge is being quoted verbatim, “hidebound” is the sort of term that Judge Kelly would use. But if Judge Kelly is correct then the NAMA receiver might not in this case, or indeed any other case, need “do the agency’s bidding”. The implication is that a party associated with a developer may indeed be able to purchase assets from a NAMA receiver even if the developer is in default. Section 172 of the NAMA Act was supposed to stop this but on a strict reading of that section and also Section 70 which defines an “associated debtor”, it could well be argued that certain associates of Jim Mansfield are allowed in law to purchase foreclosed properties. Sadly this issue seems not to have had a full airing in this case, as the judge held that Jim hadn’t sought to remove the receiver, so the receiver’s actions appeared to be moot. So we appear not to have NAMA’s side of the story, but on the face of it, the judge’s comments might be significant in future cases. NAMA had previously appointed Kieran Wallace of KPMG as receiver to assets in several companies controlled by Jim Mansfield. The receivership is described in detail here. UPDATE (1): 21st December, 2011. It is being reported that Jim Mansfield has appealed the NAMA judgment to the Supreme Court and that NAMA has apparently agreed not to seek Jim’s bankruptcy pending the outcome of that appeal, Meantime, Bank of Scotland (Ireland) has this morning secured a €214m judgment against Jim in respect of personal guarantees given to three companies – HSS, Jeffel and Park Associates Limited. Judge Kelly who was dealing with the case rejected Jim’s claim that he incurred loss following what Jim claimed was a commitment by BoSI to give him development advances – the Judge said there was no evidence of any contractual commitment to that effect. UPDATE (2): 21st December, 2011. Judge Kelly’s judgment is now available online, in which he considers – and then dismisses – Jim Mansfield’s arguments advanced to support his wish to have a full hearing of the claim. Judge Kelly granted summary judgment in favour of Bank of Scotland (Ireland).